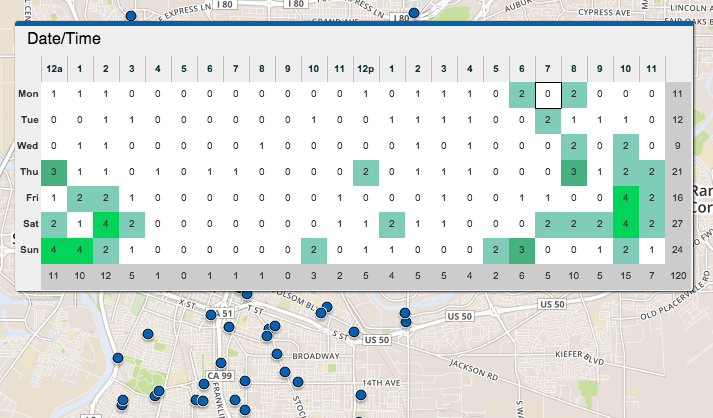 SpatialKey’s Temporal Heat Index pod summarizes your data by time of day (columns) and day of week (rows). Each cell represents a specific day of week and hour of day combination, like “Thursdays at 4pm”. This component makes it easy to spot temporal trends in your data. Like other SpatialKey pods, the Temporal Heat Index also acts as a filter; you can select any row, column, or cell to filter your dataset. This Heat Index shows the frequency of driving while intoxicated (DWI) crimes over a period of time. We can clearly see that these crimes occur most frequently on weekend nights. For any day, late evening hours have significantly more incidents than midday. This pod can be combined with a map pod to see if incidents occurring at a particular time of day or day of week are more likely to occur in a particular location. A timeline could help determine if any of these trends are changing over time – for example, as the result of a crime reduction program. The Temporal Heat Index pod will appear as an option for any fields in your dataset with date/time data type.